I am Steve Nelson and this is my wife Carol and daughter Lindsay. 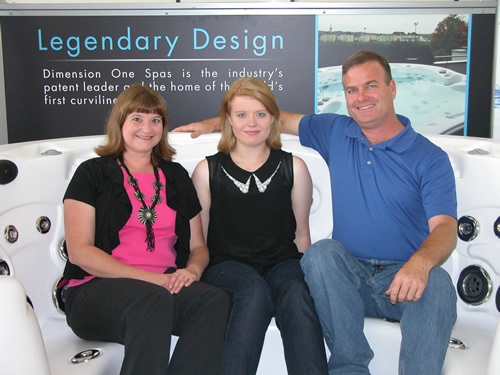 We own Hot Tubs Albuquerque, which opened its doors in 2001, but we have been in the spa care business since 1997. We love New Mexico, and enjoy camping, fishing, and the other great outdoor opportunities here. One of our favorite activities is relaxing in a nice hot tub under our beautiful night sky. Our business motto is: Hot Tubs Albuquerque, a new way to shop for your spa. When you come into our store we want you to feel like you are in a very friendly and comfortable place, and this is why we do not believe in high-pressure sales tactics . Also, our business is all about hot tubs, so we do not sell pool tables, stoves or grills. Change to Our business philosophy is it is our job to make your dream happen on your time table. We believe that every hot tub is a serious investment in the enjoyment of life, and to ensure this, we offer a thirty day upgrade policy on all hot tubs that we sell. What makes us happiest is to have happy hot tub owners!